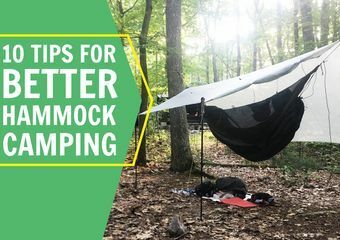 Now that we know how to make hammock camping better, its time to lighten the hammock load and go for bigger hiking days. To begin: Get a baseline weight for all current gear (Excel or similar spreadsheets work well) for comparison purposes. Then start trimming ounces by exchanging or modifying gear for lighter items. As a setup evolves, items can turn into multi-use, and other items can be left behind. It’s important to note that in general, with weight comes comfort. Everyone has to decide for themselves what level of comfort they are willing to give up for weight savings. Some people can take this overboard and end up adding a few things back, winding up with an optimal setup. Hammockers are no exception. Now the slow degrade of comfort begins. In ounce (gram)-counting land, less material equals less weight. To lose material, a hammock can get shorter or narrower. Prior to going to a smaller hammock, make sure to consider your own height and stature. Ed Speer (hammock pioneer) recommends the distance between the knots of the hammock equal the user’s height, plus two feet. 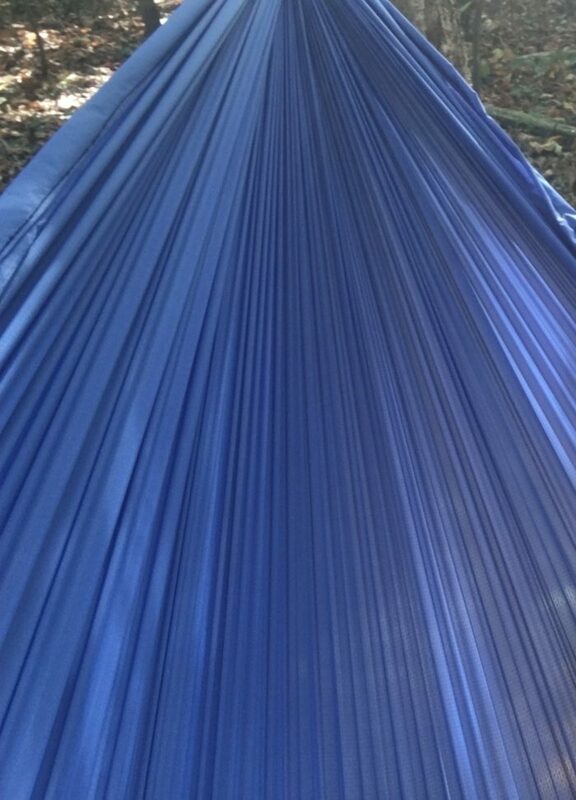 While my 11′ hammock is very comfortable I have experimented with length and found a hammock with about 9′ length to be tolerable at a height of 5’7″. Material weight can also be saved by getting a narrower hammock. This is tricky, because the narrower the hammock, the less of a lay angle you get. You could wind up not getting that nice flat lay, or getting too much shoulder squeeze. Again, experimentation is key to finding the right width. Also, if using a double hammock for weight capacity reasons, it may save some weight to go to a single hammock but use a heavier material. For example Hexon 1.6 (1.6oz/sqyd), has a weight limit of 350 pounds. Hexon 1.0. Light spots in the bottom right are actually light showing through, to give an idea of how thin the fabric is. Advances in materials have ended the days of 1.9 ripstop hammocks for the gram-counters. Changing materials could possibly net savings in the ounce range. The lightest material I have worked with is Hexon 1.0 (200# weight limit). Alternately, check out 1.1 material from companies like ripstopbytheroll for higher weight capacities. Going from a 1.9 weight to a 1.0 weight material can yield significant weight savings. Check out Hexon 1.0 and 1.1 Ripstop Nylon. Note: A lighter hammock material should only be considered if the user meets weight requirements for the fabric. Many long-distance hammock hikers choose a partial-length underquilt to save weight and pack volume. When switching to partial length, bring something (reflectix) for the back of your legs, and a pillow for your head/neck. This will insulate the areas the partial underquilt doesn’t cover. Even after theses additions, backpackers often net baseweight savings. 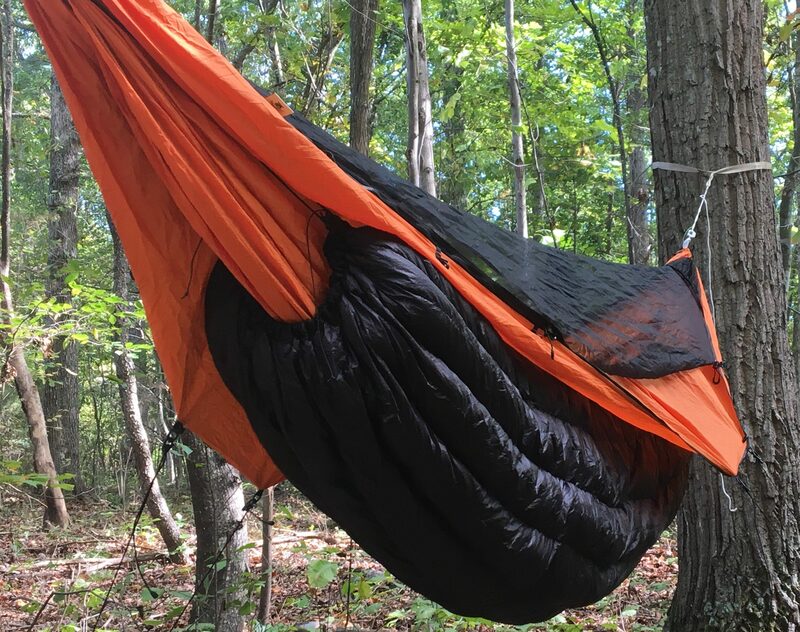 For example, a standard 40F full-length underquilt weighs 16.15 ounces, while a 40F 3/4 quilt weighs 11.37 ounces. Even by carrying extra insulation (can be multi-use, like pack frame or sit pad) weight savings are still found. Full disclosure—I’ve tried this and find it uncomfortable, but others have had luck with pads, including at least one Triple Crowner. The weight saving is clear though. A 1/8″ pad from Gossamer Gear weighs 2.8 ounces, versus even the partial under quilt at 11.37 ounces. Having a pad is also useful if all the odds are against a hammocker and they have to sleep in a shelter or on the ground. Tip: Cut pad into to pieces and form a T to insulate the back of the shoulders(pictured below). 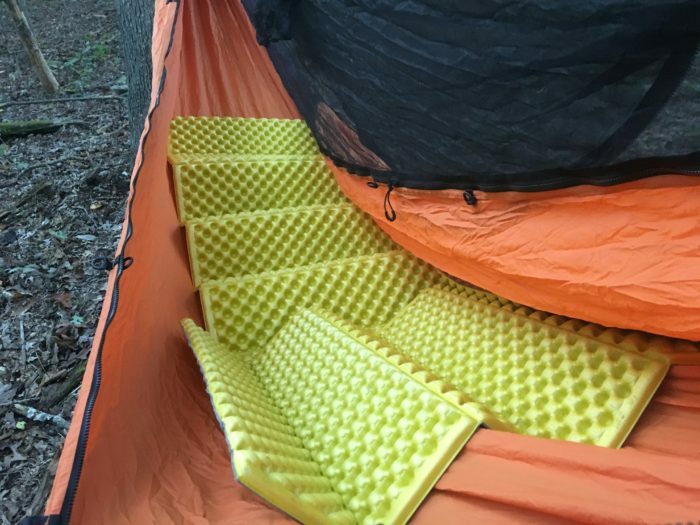 The Z-Lite pad below is a thru-hiker favorite but with a 10-ounce weight for the small, other pads may be a better option. Carrying many stakes for multiple tie outs—whether for side pullouts or doors—can add up quickly. During my AT thru-hike, I carried four stakes for corners and found creative ways to pull the sides of the tarp out if needed (rarely). Lightweight plastic buckles can help avoid door stakes (no-stake door setup here). For lighter stakes, check out carbon fiber or titanium shepherd hook stakes. Material advancements have made it possible to make tarps from extremely light material that still offers good coverage. 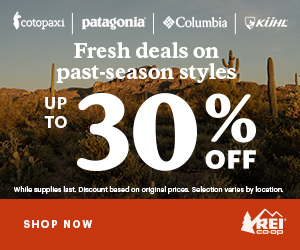 The lightest material on the market is Cuben Fiber, or Dyneema. Though expensive due to high material costs, a Cuben Fiber tarp offers considerable weight savings for long-distance hikes… for hammockers and ground sleepers. 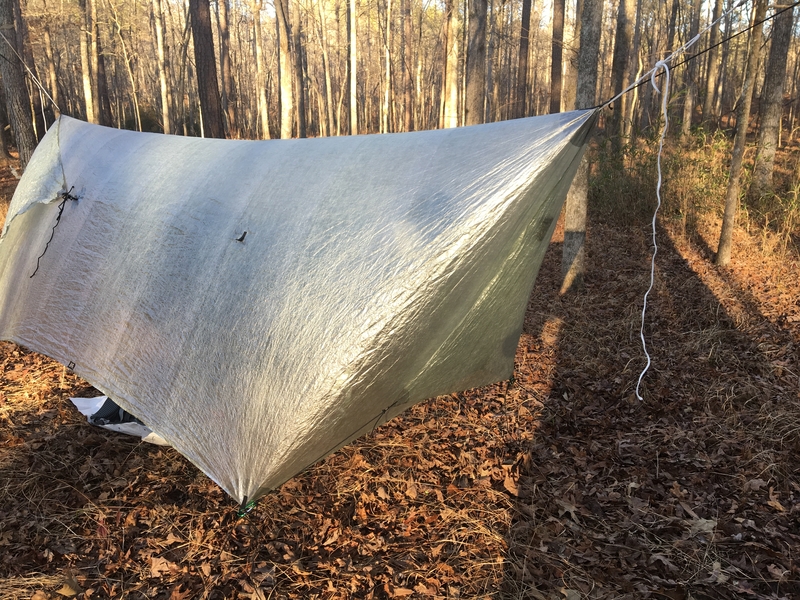 Hammock Gear’s Cuben Fiber Tarp (0.50 oz/sqyd) with 11’x8’6″ coverage weighs in at 5.19 oz. Xenon 0.9 Sil, a lightweight waterproof tarp material at 0.93 oz/sqyd would weigh in at 9.66 oz for the same coverage. A material change with equal coverage can save 4.5 oz… or just over a 1/4 pound. Less tarp equals less weight. 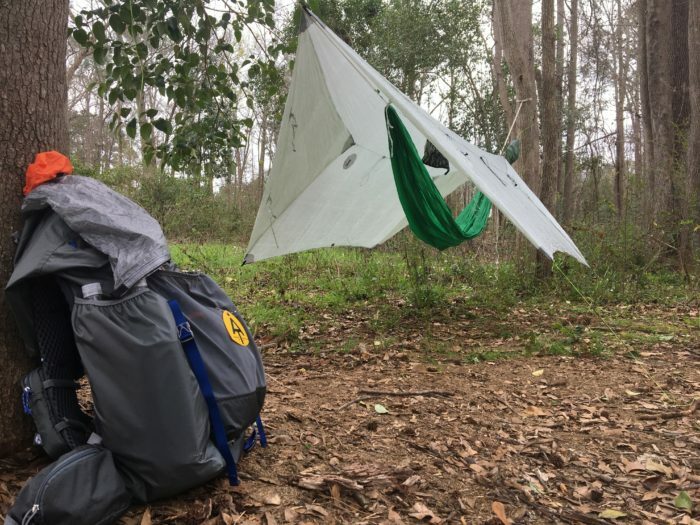 If you go with this method, make sure to practice setting up the tarp, especially if using an asym tarp. I have heard myths that these can keep someone dry in a rain storm, but my experience in talking with users leads me to disagree. Check out Dutchware Wide Asym Tarp and ZPacks Cuben Fiber Asym Tarp. While the beetle buckle suspension with 15′ straps are awesome, and have made hanging on giant trees possible, they also weigh 6.4 ounces. 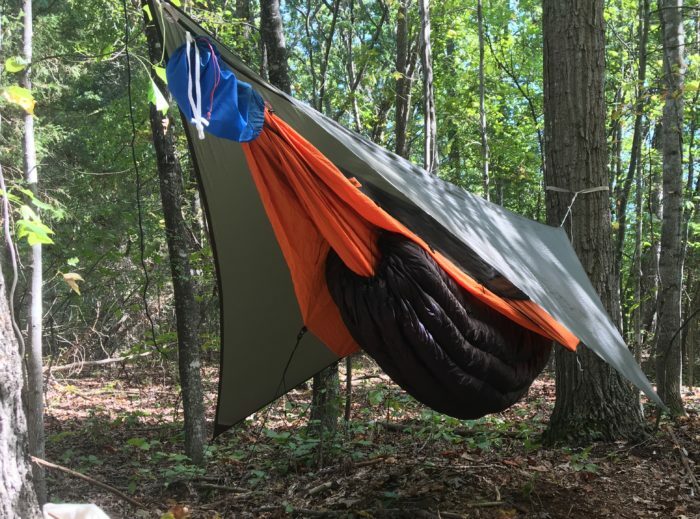 Lighter suspension options can save ounces off a hammock setup. For example, the Hummingbird Tree Strap combo tips the scale at 2.3 ounces, and with a slight suspension modification, you can get away with no hardware except the hard plastic button on Hummingbird’s button hook suspension. Professor Hammock even went so far as to make a suspension with no hardware. There are several bug net options (varying in weight) that may save a few ounces. 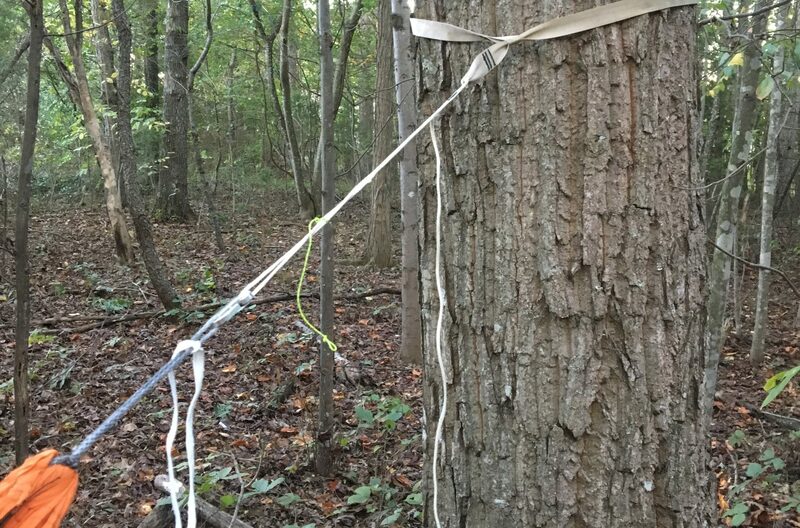 The material and amount of cordage used on a tarp adds up. My experience has been that a sturdier line is needed for the ridgeline, while lighter cordage can be used on other guylines. After all those tips, it’s time to get the scale and sizers out and cut that weight. 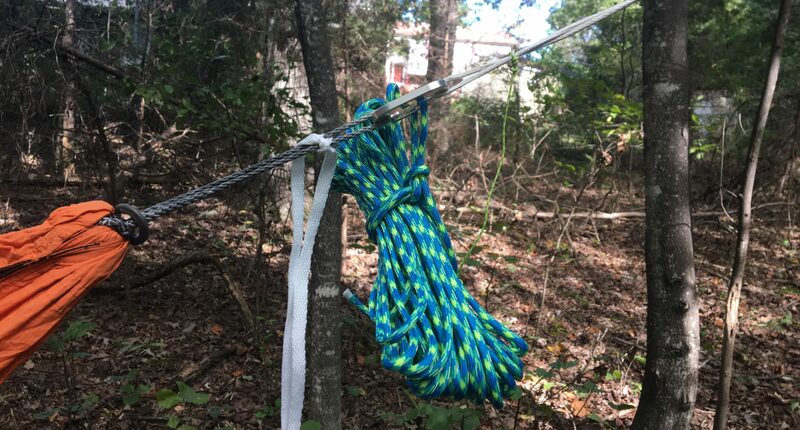 Comment below if this article trimmed even 0.5 oz off your hammock setup, or if you have any tips to share! Excellent post, and thanks for noting that with weight often comes comfort. Sometimes a few extra ounces in gear weight can equate to a warm, comfortable night versus shivering in the dark trying not to think about it. Along with weight savings in the sleep system comes lower volume which may enable a smaller pack which itself will save a few more ounces. I agree about pack size but I find varying weights as you go down in volume from company to company so I shop around for mine. – I really need to invest in a 40 or 50 degree partial length UQ for summer trips. My 20F full length quilt is luxurious and wonderful for winter, but is definitely overkill in the summer! Thanks for reading glad some of these tips may help you out. I am not a fan of the pad and prefer my under-quilt when I know trees are definitely in the area. I use a pad under my feet with my 3/4 under quilt that also doubles as a pad if I need to sleep on the ground. Personally I’ve had wind rip stakes out of the ground leading to me getting wet from rain so I will always carry mine and then reinforce with rocks or other heavy items available. I have a 3/4 length 20F underquilt which I’m enjoying using for now. I have a full length 40F thats a little heavier than the 3/4F 20 but it is very comfortable as well. I used it on the AT between Pearisburg, VA and The northern terminus.